As the year closes, reflection and introspection become more common practices. Looking inside oneself and back on 2018 (a year that was probably challenging for a lot of us) is certainly important, but it’s also crucial that we don’t carry the weight of our challenges alone. Dialogue within our community is vital. More likely than not, there is someone else in your circle that can empathize, or at the very least, offer some comforting words. This month’s interview with our featured creator, filmmaker Nate Araya, feels especially timely given that many of us are probably bracing for how the cold weather affects our emotions and mental well-being. Nate is a filmmaker and storyteller whose life’s purpose is to “meet a need and solve a problem.” His work, which has been featured in publications like The Huffington Post and MSNBC, is fundamentally inspired by his experience as a first-generation American and his drive to tell stories that often go unheard in order to spark dialogue within communities. As a first-generation American (born in the greater Dallas area from an Ethiopian immigrant mother), Nate is uniquely equipped to identify and spark important conversations in his community. The first episode of Growing Up in America focuses on mental health, an issue that communities of color often sweep under the rug. Discussions about mental health in communities of color are often fraught with tension and stigma. Historically, minority communities in the U.S. have had little reason to trust healthcare professionals. Even now, Black women are “three to four times as likely to die from pregnancy-related causes as their white counterparts,” according to the Center for Disease Control. In order to provide a safe space for conversations about mental health, Nate not only pursues projects like Growing Up in America, he’s also intentional about sharing his own vulnerabilities and struggles. Navigating this feeling of inadequacy is a major source of trauma for first generation immigrants. Immigrant parents’ views on survival and success can be in direct conflict with the American values of self-actualization and individualism. When children deviate from what “success” looks like to their immigrant parents, the parents’ immediate concern becomes, “Will my children survive?” From the children’s perspective, their parents can seem heavy-handed or close-minded. Add into the mix an environment where parents and children don’t necessarily talk about their feelings, worries, or struggles -- it’s a recipe for misunderstanding. Nate started college as a Pharmacy major primarily because that’s what “success” looked like to his family. He quickly realized he didn’t feel fulfilled within that area of study. Serendipitously, a professor introduced him to the field of communications, and he made the intuitive switch. The holiday break during his freshman year inevitably involved a lot of conversations with his mom. Though there is still a gap between Nate’s and his mother’s definitions of “success,” love and genuine respect for each other fuel their relationship. At the end of the day, hard work is a value that they can always agree on. In proving his conviction not just to his mother but to himself, Nate accepts his unique first generation culture – a culture that’s not fully Ethiopian, not fully American, but uniquely his. Nate’s priority now is trying to find the balance between creativity, supporting his family, and financial sustainability while pursuing his purpose of meeting needs and solving problems. He’s got a lot on his plate, but his dedication to his community, especially through cultivating meaningful dialogue, serves as a source of personal fulfillment. You can keep up with Nate’s work on Instagram and keep an eye out for future screenings of Growing Up in America. This year’s Hispanic Heritage Month vibrates with a unique energy. In 2018, the political spotlight shines on the Latinx community not only as a celebration of culture, history, and success, but also because of the demographic’s growing influence. The midterm elections are inescapable in the news, especially in the midst of Texas’ heated and close Senate battle. For this month’s feature, the collective blue team was intentional about highlighting an individual that represented both sides of the coin -- creator and political activist. 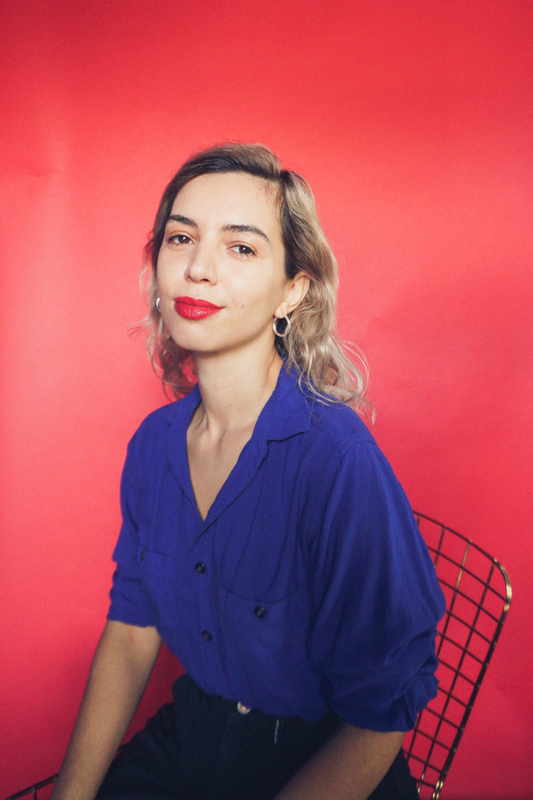 We were incredibly honored to sit down with Maria Oliveira, co-founder of Passport Vintage – a vintage shop that’s been featured in publications such as Glamour, Harper’s Bazaar, and Refinery 29 – and social media coordinator for Jolt Texas, an organization that brings Latinos from across Texas together to exercise their collective influence and power. Over the past few years, Maria has thoughtfully combined her experience in the fashion industry and determination to create diverse spaces to advocate for the Latinx community. While interviewing her at Greater Goods Coffee (another local business owned by a woman of color), she talks about her relationship with immigration, fashion, and the Latinx community. At 11 years old, Maria left her home country of Brazil with her family and settled in Ft. Lauderdale. The school that Maria attended didn’t offer English as a Second Language Services, so she had to overcome both the challenges of learning in a classroom setting and piece-mealing together an unfamiliar language. Despite the obstacles in front of her, Maria ultimately excelled. Due to her legal status and family finances, higher education wasn’t an option. Maria started working at American Apparel immediately after graduating from high school where she worked her way up from Retail Associate to District Manager in Miami and then in Chicago. Eventually, her relentless drive led Maria to take a chance on herself. Passport Vintage came about as a result of a timely business partnership and Maria’s “political awakeness.” Although American Apparel gave her a crash course in retail and fashion, Maria was discontent with the lack of representation and opportunities for people of color in the industry. She knew that if she wanted to improve the industry she loved, she had to create that opportunity herself. Although newcomer brands like Fenty Beauty have been revolutionizing the beauty and fashion industry, there are many long-term giants in the space that tout diversity and inclusion as marketing ploys as opposed to a true priority. Maria believes that it’s important to support brands that stand for the right values from their inception as opposed to those seeking to capitalize on recent trends. Maria’s activism extends beyond Passport Vintage. The passing of DACA in 2012 ignited Maria’s advocacy for immigrants’ rights. Her previous status as an undocumented immigrant and her brother’s status as a DACA recipient became driving forces for her political activism. After moving to Austin, Maria felt that it was “serendipity” that led her to meet Cristina Tzintzún, Executive Director of Jolt Texas. In today’s political climate, we often waver between righteous action and paralyzing helplessness. Living in America as a woman, a person of color, or a member of another marginalized community can be exhausting and feels like we’re in a constant state of resistance. Sometimes we just want to be and create without constantly feeling like we have to fight. Since there is often not much representation of diverse creators, it can feel like we’re not allowed to produce imperfect work because whatever we produce represents the quality of our communities as a whole. However, we shouldn’t forget that the fact that our work even exists – and that offering individualized perspectives into our shared identities – is resistance enough. For Maria, resistance looks like creating a space for herself in an industry she loves and prioritizing her own dreams. She’s found a balance between combining work that makes her happy and helping her community move forward. When asked about how to best support her, Maria told us to go vote. Given the current political environment, your vote this midterm elections could make a significant difference in bringing about change. Below are some helpful dates and links to help you get out and vote! You can register to vote by printing out the form from this link and follow the directions to mail in your voter registration. If you’re unsure if about your voter registration status, you can check through that same link – www.votetexas.gov. The non-profit organization vote.org is also another credible source that’s easy to navigate and user friendly with simple language: www.vote.org/state/texas/. Here’s a list of early voting locations in Travis County. There are also mobile voting locations as places like local supermarkets and recreational centers. We highly recommend voting early to avoid the crowds on election day. Here’s a list of election day voting locations in Travis County. Where can I read up on candidates and issues for the 2018 Texas midterms election? Political news sites like Texas Tribune have a breakdown of the Texas Elections. You can also search for your general election ballot here by entering your county and then doing research on the candidates on your ballot. Lastly, you can follow Maria, Passport Vintage, and Jolt Texas on Instagram to stay up to date with their work.